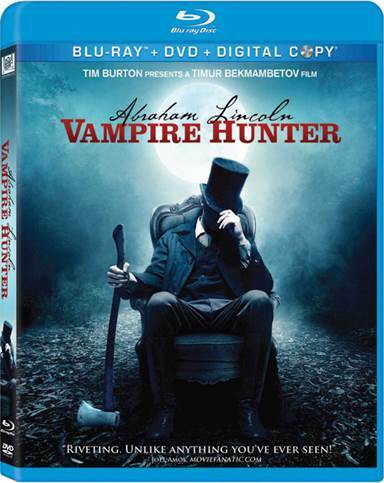 Abraham Lincoln: Vampire Hunter Is A very good horror flick with some hair raising fright sequences. Set in the 1800s this action thriller has an odd title, one that turns history on its ear. Called Abraham Lincoln:Vampire Hunter, the film exaggerates the famous US President's penchant for destroying evil. More of a horror flick than a history lesson I found the tall tale very entertaining with some excellent CGI to ramp it up. The film has been released on 3D Blu-ray, Blu-ray and DVD individually and in combo packs. Young Abraham Lincoln witnesses his mother's pointless death by a vampire terrifying the boy. We move to years later with Abe (Benjamin Walker) as a grown man. With a growing thirst to settle the murderous debt in retribution, he's always on the lookout for the evil monsters and often goes looking for them. On the docks one night Abe gets attached by vampires and gets saved by Henry Sturges (Dominic Cooper) who knows all about the blood suckers. The two men bond and Henry teaches Abe how to hunt and fight vampires. After some years have passed Henry reveals to Abe his mother's killer, Adam (Rufus Sewell) a 5000 year old vampire who owns a Plantation in Illinois. Abe finds out that Adam has a plan to take over America, so he starts a political career, marries Mary Todd and later becomes President. When the Civil War starts to peak and Adam takes sides with the South, Abe starts a battle of wits to catch the succubus. The story as ridiculous as it may sound, does entertain. Think of it as a horror story interlaced with comic overtones, even if it is about one of our greatest US Presidents. The intrigue, action and historical background work together to form this dark picture taking place during the early to mid 1800's and told with some excellent tongue-in cheek. I like the characters, the actors who portrayed them and found direction by Timur Bekmambetov broad and creative. Leading the acting is Benjamin Walker playing a vibrant and forceful Lincoln who swings a silver coated axe while pursuing the blood thirsty ghouls. Not a well known actor, yet looks as seasoned as some of Hollywood's A-list performers, Walker has the screen presence that will make him a big star in the not so distant future. In support, a TV and film regular Rufus Sewell puts a lot of energy into his Adam, a fierce competitor and very terrifying character. Working with some very good special effects, CGI and make-up, Sewell's Adam in conflict with Walker's Lincoln makes the film's horror work. The Great Calamity Graphic Novel- It's a quick comic book style production featuring the origins of the vampires coming to the US. Audio Commentary with Writer Seth Grahame-Smith- This does help in some sequences, especially those you may not have understood when watching the film. On the Set: Abraham Lincoln: Vampire Hunter, Vampire Hunting: Fight Choreography, The Art of Transformation: Make-Up Effect. A Visual Feast: Timur Bekmambetov's Visual Style. Identified by what they include in each, this sectioned off making of the film makes it easy to revisit. The production quality is good and the content provides some interesting secrets of movie making. My favorites are the fight choreography and make-up. The Video Quality tends to be in line with most Blu-ray presentations including sharp visuals. Some of the night scenes are a little grainy, but that may be just me being a little picky. However, since action does take place in some dreary and dark sequences, this may be a problem for some viewers. The Audio Quality is completely up to par using DTS-HD Master Audio 7.1. Turning up the volume drives the sound to some awesome d-bells, but be careful not to blow out your speakers. Even the DVD with Dolby 5.1 does a terrific job playing through my Blu-ray to my Television speaker system. Download Abraham Lincoln: Vampire Hunter from the iTunes Store in Digial HD. For more information about Abraham Lincoln: Vampire Hunter visit the FlickDirect Movie Database.